Learning to play the koto, a traditional non-Western instrument, can foster all the musical ability and knowledge required to meet the National Standards, while also attracting and educating students in ways that a traditional Western instrument cannot. It teaches culture and language of another country, which leads to better understanding of people’s lives in other parts of the world, and also adds value to those who have knowledge of other music styles. 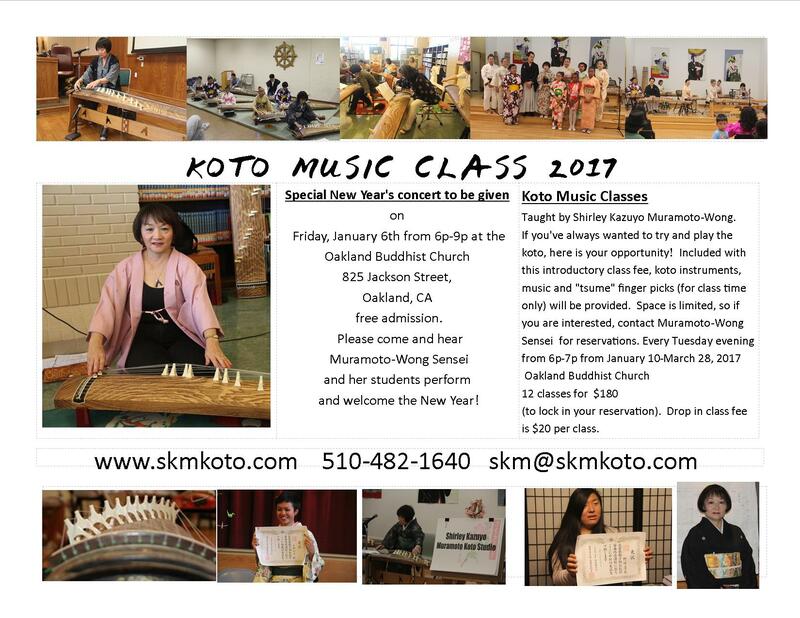 Shirley Kazuyo Muramoto brings the experience of over 40 years of playing the koto to her students. Her students experience improvement by focusing on the important basic techniques and level appropriate material, based on learning books from the Chikushi Kai Koto School of Fukuoka, Japan, and are exposed to koto music from traditional to modern styles. Muramoto is available for private lessons, and can teach koto classes for up to 10 students per class, if at least 5 students and venue are provided. She has also presented clinics and classes at many schools and universities.